Reward your employee of the month with a reserved parking space. 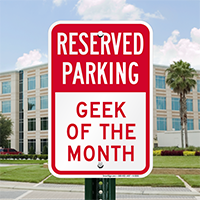 This 'Reserved Parking-Geek of the Month' sign has a tint of humor attached to it. • The sign is large enough to be read by all. • Sign is rigid, durable and does not rust. • Installation takes only a minute with pre-drilled holes on the sign.